Building strong, cohesive, and powerful teams can be a daunting task. From team building activities to creating a positive company culture, the ways to boost performance and help teams succeed are endless – which is why we’ve compiled a list of our favorite tips for creating – and sustaining – strong teams. Check out these six simple tricks to help you create an amazing team! Focusing on building a strong team now will pay dividends later. #1 Show your teams that you value them. Teams often perform better if they know they are valued and feel the work that they do matters. Be creative and show your teams how important they are to overall company success. #2 Encourage team members to congratulate each other. This type of camaraderie and pride is great for making your teams stronger. If your team is remote try creating a space for positive feedback and small wins where employees can share something AWESOME a co-worker did or accomplished. #3 Don’t leave any team members behind. Sometimes it can be difficult to get teams together outside of work hours. 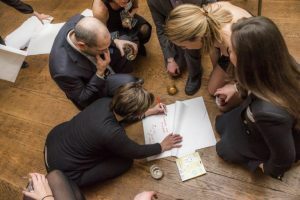 When planning team building events think about doing them during work-day-hours or cater to your employees’ personal lives by providing services like childcare or a car service during the activity. This gives everyone the opportunity to get involved. #4 Create a safe and open environment so everyone feels comfortable sharing. Teams are normally made up of an array of personality types: introverts, extroverts, ambiverts (that’s someone who has both introvert and extrovert qualities) – so don’t forget to plan activities and organize meetings in a way that embraces all personalities. Everyone should feel comfortable participating or get a chance to speak. #5 Practice, teach and get better at problem-solving. Encourage your teams to try creative problem solving and solve problems on their own first. This can help make them become more confident in their roles. If you create an environment that promotes collaboration, your teams will share ideas, create new ones, and help each other do their best and make decisions.